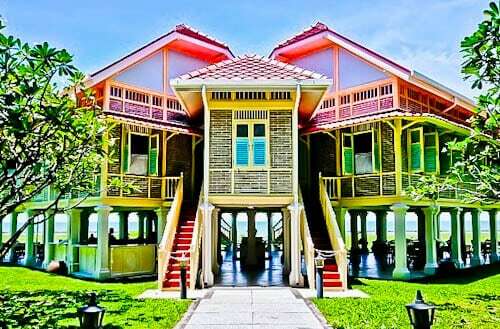 Hua Hin offers many cheap hotels in the center of town or 5 star resorts along the coastline. The main building you can see in Hua Hin is the Hilton hotel which is great value for a Hilton in the center of town (above). 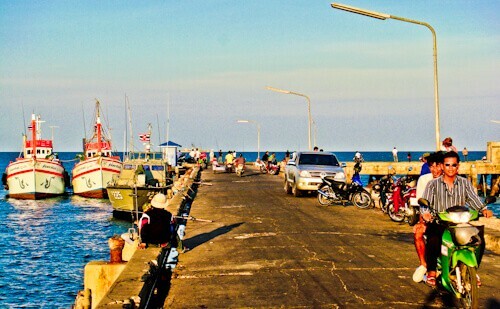 Hua Hin is a small city and you’ll be able to walk to restaurants, bars and a few points of interest on foot. In front of the Hilton is Hua Hin beach but there are far better beaches both north and south of the city. A Thai style shopping mall can be found a short walk from the Hilton called Plearnwan Retro Village, you’ll find many photo opportunities as well as good food here from 10 am. 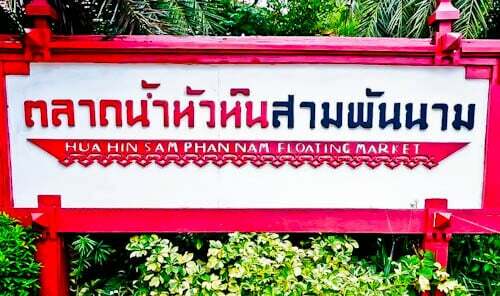 Hua Hin has its own floating market. The most famous floating market in Thailand is expensive and a hassle to get to, so why not try Sam Phan Nam Floating Market? Furthermore, it’s a relaxing and picturesque floating market. Each evening, Hua Hin hosts a huge night market. The main draw here for tourists is the Thai street food. As a matter of fact, the street food in Hua Hin, has a more sea food theme than those cities further north. Mrigadayavan Palace is the former seaside residence of the 6th King of Thailand. 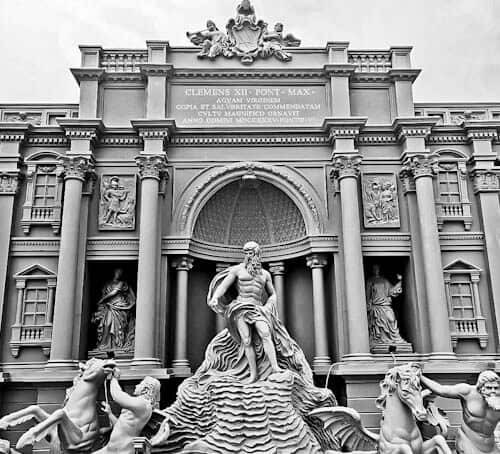 There is a mall in Hua Hin called The Venezia. Not only is it a shopping mall but it’s also full of Venice Landmarks. For this reason, you can pose in front of St Mark’s Clock Tower and fool your friends into thinking you’re in Italy! 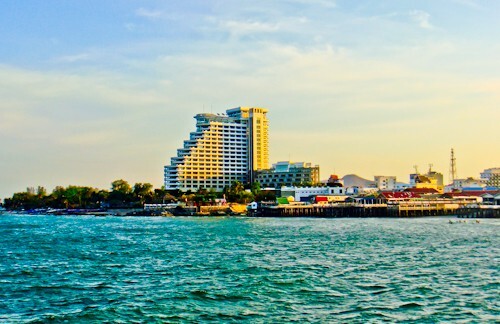 Hua Hin is famous for fresh seafood which is no surprise as it has easy access to the Gulf of Thailand. You can take a walk on the pier to watch the seafood being unloaded from fishing boats and sold to restaurants as well as markets. I expect the majority of seafood you see at the night market passes through here. Finally, you’ll find seafood restaurants in many locations in the center too as well as vendors selling fresh seafood on Hua Hin beach. There are 2 major temples a drive south from the center of Hua Hin. 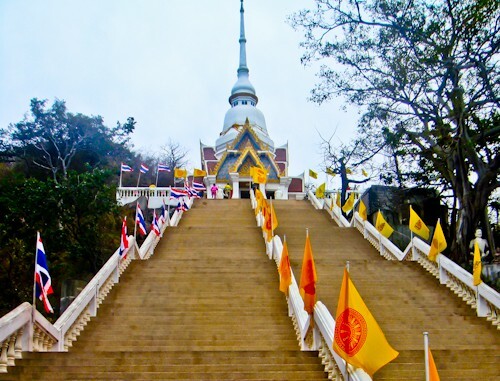 Wat Khao Takiab is the type of temple you see in the movies with the large staircase leading up to it. In addition, you’ll see many monkeys at this temple, which are very friendly therefore take care of your belongings! If you do go out to visit Wat Khao Takiab, then you must also visit Wat Tham Khao Tao which is on the way. Lastly, there is also a modern shopping mall called Hua Hin Market Village which is useful if you need to cool down after visiting the temples. If you don’t want to take a drive away from the city center there is one temple you can visit in the center called Wat Huay Mongkol. This is a modern temple with a huge statue of a Thai monk as the centerpiece. Hua Hin is a popular golfing destination and home to the oldest golf course in Thailand, Royal Hua Hin. You can also play at Black Mountain golf course, the most famous in Hua Hin which hosts several major tournaments throughout the year. Banyan Tree golf course is another excellent golf course which also hosts major tournaments. Hua Hin, Thailand not only boasts several world class golf courses, but the prices are very reasonable. If you wish to play I recommend this golf company which can arrange transfers, tee times and caddies for you. Even if you don’t plan to take the train, I recommend you visit the historic train station. Firstly, there’s an old American steam engine beside the tracks. Secondly, there’s a blue telephone box and lastly, the iconic Hua Hin train station sign. 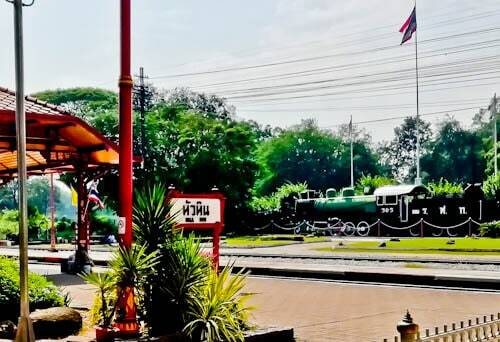 This train station truly is a top Instagram spot in Hua Hin! 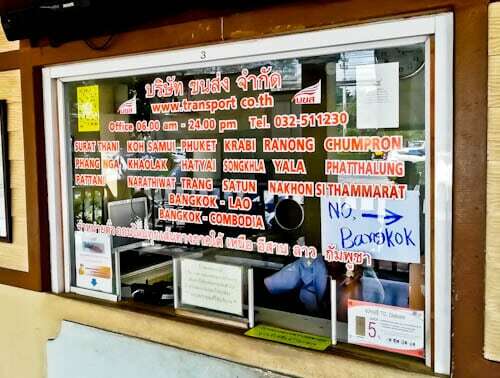 If you wish to catch a train, there are only limited trains which head north to Bangkok. There is an overnight VIP bus service between Hua Hin and Phuket, you can buy the tickets from the center of Hua Hin for a small commission or buy them directly from the bus station. The overnight bus takes around 10 hours and arrives at the bus station in Phuket Town, Phuket. Where is Hua Hin Bus Station? Hua Hin bus station is located on Hua Hin Soi 96, here is the exact location. I highly recommend the overnight VIP buses which leave at 9 pm and 10 30 pm. Alternatively you could go on a regular service which leave at 6 am, 7 pm or 9 pm. Finally, the price for a VIP ticket is 913 baht or 587 baht for the regular service. It is very nice you give the detailed description of Hua Hin as it is not written anywhere in so detail. 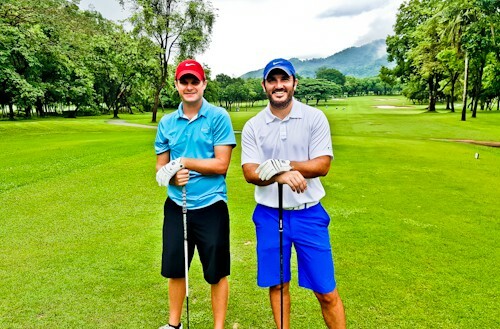 Golf in Hua hin looks tempting and must try activity. Climbing stairs to Wat Khao Takiab temple would be lovely and also encountering the monkeys would be fun. It is good that there is an overnight bus to Phuket. I’m a Hilton Diamond, so I appreciate your recommendation of that property. It looks like it is in an awesome location. Did you get to spend any time on the beach there? I know you said above that it was not the best beach in town. Was that because of too many people selling things to you? Or what about it was bad? Also I saw you mentioned the night market. What interesting things did you find there? Hi John, Hua Hin beach is ok, but there are many resorts out of town with quieter beaches. There are not many people bothering you on the beach, they mainly try sell seafood. At the Hua Hin night market they sell lots of fresh seafood and fresh fruit. You’ll also find summer clothing, DVD’s and phone accessories. I’d never heard of the city of Hua Hin! Sounds like a nice place to explore and I’d love to go there for the seafood, it always tastes better when eaten by the sea! I am so sad that I missed Hua Hin on my visit to Thailand. I am a fan of the beach and the seafood and it is truly a perfect vacation for me to get away from the hustle and bustle of Bangkok. The view of the Hilton Hotel looks amazing and the Venice themed mall sounds interesting. I wish I could be back in Thailand and take a trip there to check out the beach, golf course and the night market. You would have loved the fresh seafood stalls at the night market! I had never heard of Hua Hin on the Thai Peninsula. Sounds like a great little spot to break up a long journey on the way back to Bangkok. The night markets and floating markets sound like my kind of place. Haha! I like how you describe a temple as ‘very instagrammable’! Wat Khao Takiab looks like a much more impressive, my type of temple, which would be worth the drive to reach it! Overnight 10 hrs drive would be perfect to travel from Hua Hin to Phuket! Noted Iza, I’ll update the post with some pictures of the night market and seafood. I went to Thailand about 20years ago and I have always wanted to venture back. Not heard of Hua Hin but it looks really nice and I would be happy to stay at the Hilton especially because it is reasonable priced. 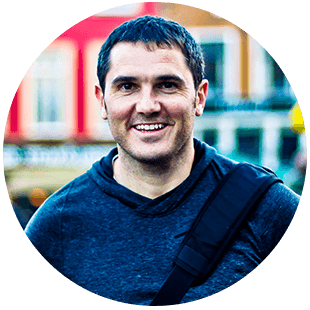 I also love seafood, temples and night markets, so I am definitely sold on the place. I know Bangkok and Phuket… But I don’t think I had any idea about Hua Hin in particular. Thanks for such intricate details. I think the floating market would be an unique experience. Golf isn’t my thing but I won’t mind lazying around those lush green plains. I will be making this journey in the near future, Hua Hin looks beautiful. 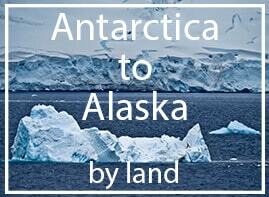 We will check out the Hilton when we visit, the location in the center of town is perfect. I am certainly keen to check out the night markets there too, perfect for foodies.